Your Fastly account can be managed by multiple users. You can control each user's role, as well as control the scope of their service access and their specific permission levels for that service access. TIP: The roles, service access, and permission levels you assign to users do not affect their ability to submit requests to Fastly Customer Support. User. View stats, analytics, and service configuration information for all services on an account. Billing. View billing information about an account. View stats and analytics information for all services on an account. Engineer. View configuration details, issue purge requests, and make configuration changes, including activating new service versions. Some of these abilities may be restricted on a per service basis. Superuser. Full account access, including service configuration, user access and control, and account management capabilities for an account. Superusers cannot close or cancel an account unless they are also the account owner. Read-only. Allows an engineer to view a specific service's configuration but does not allow them to issue purge requests for that service nor make changes to its configuration. Purge select. Allows an engineer to view a specific service's configuration and also allows them to issue purge requests for that service via URL or surrogate key. They cannot use the purge all function on the service, nor can they make configuration changes to that service. Purge all. Allows an engineer to view a specific service's configuration and issue purge requests via URL, surrogate key, or the purge all function. They cannot, however, make configuration changes to that service. Full access. Allows an engineer full access to a specific service, including permission to issue purge requests via any method on that service. They can make configuration changes to that service and can activate new versions of it at will. Permission levels are additive. Each level includes the previous level's permissions. When new services are added to an account by a superuser, engineers with limited access to services will not be granted permissions to those services until a superuser specifically grants those permission levels manually. Users assigned the role of engineer can create new services (this is especially useful for learning about configuration options without affecting production services). By default, an engineer will automatically have full access to any service they create until their permission levels on that service are modified by an account superuser. Users assigned the superuser role can change the role, service access, or permission levels for any existing user on your account. Plan your changes carefully. WARNING: Role, service access, and permission level changes for existing users apply instantly and get saved automatically. In the Users area, click the gear icon next to a user name and then select Access controls from the menu that appears. The Edit access control page appears for the selected user. From the Choose their role choices, optionally select a new role for the user. Optionally, check the TLS management box to grant TLS configuration access to a user. Users with the role of superuser have this permission by default. 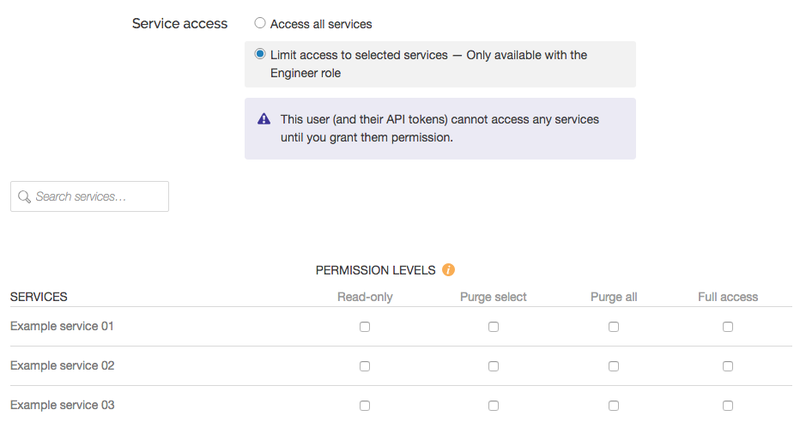 If you've limited access to selected services for a user assigned the role of engineer, select the specific permission levels for each service associated with the account. Click Update. The user's role and permission levels will be changed accordingly. We assign account "ownership" to the first user who signs up for an account for your organization. We automatically assign owners the superuser role, though that role can be changed by another superuser once additional users are added. Accounts can only be canceled by owners. In addition, account owners serve as the primary point of contact for billing purposes. Invoices are sent to them, but if a specific billing contact has been defined for an account, invoices go to that contact instead. To transfer account ownership to another user, contact support@fastly.com for assistance.